Do you have a dark and dreary room that needs natural light to cheer it up? Are you looking for an energy-efficient way to brighten your home? A skylight is the perfect way to flood a room with sunlight and add value to your house. 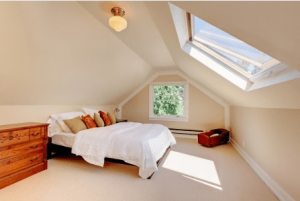 When deciding to install a skylight, however, it is important to keep these four tips in mind. Before spontaneously adding a skylight to your home, it is important to choose the proper placement. Usually placement is determined by your home’s rafters, and a blueprint of your home’s design should be consulted before selecting the location of your skylight. When making a big change to your home, planning is key. You need to consider what room you are adding the skylight to as well as how the sun will hit it throughout the day. Since the effects of a skylight are very different from a window, rooms can be overheated if the placement isn’t chosen properly. Plus, furniture could be bleached from the increased levels of sunlight. Consider using gray- or bronze-tinted glass in your new sunroof to diminish the sun’s rays or use built in blinds to provide insulation during hot, sunny days. Homeowners should also consider of how the skylight will look from the outside. If your skylight faces the street, it may look out of place. Instead, try to align the skylight with a door or window so it looks like a purposeful architectural element. Don’t fall victim to a common skylight mistake. When choosing the size of your skylight, don’t skimp! Although a smaller skylight may seem less expensive, you do not want to go through the installation process only to have an insignificant amount of natural light come through your skylight. The same goes for choosing an extra-large skylight – too much light can overheat the room, and you want to be happy with the final result. You should also consider the right shape for the room. A tubular skylight is the top-recommended skylight shape for a small space like a second bath, but a more traditional rectangular-shaped skylight might work best for a larger space like a living room or kitchen. Your best bet is to work with your space to find the right fit for you. You don’t want to blindly go with the cheapest option when installing a skylight. High quality products help with energy efficiency, water tightness, sound reduction and wind and weight resistance. You also need to think about shading and ventilation when choosing a skylight. There are many factors involved which can make your skylight installation a good or bad experience. To be sure you are satisfied with your new skylight, consider all the elements and speak with a professional who can help you make the best decisions for your home. Although some avid DIYers want to install their own skylight, quite a few things can go wrong if you install it yourself. Improper cuts can damage ducts or wiring, and less-than-perfect seals could leave you leaking water into your home where the skylight is installed. Hiring a professional is the safest way to add a skylight. Professionals can judge whether the weather is right to start the project, use the right flashing kit for the job and can add additional drywall around the area if necessary. Plus, a professional installer will take proper safety precautions – meaning you don’t have to worry about falling off the roof! Roofing by Bruce’s professional roofing contractors and specialists are experts at installing a variety of skylights. We take the stress out of home repairs and installations by completing projects in a timely and cost-effective manner for you. To learn more about installing a skylight or to schedule a consultation with one of our experts, give us a call at 570-424-7250 today.